I'm a sucker for the oldies. The really don't make 'em like they used to. A very spooky Halloween to you and may you not have your skull bonked upon with an armbone! Apparently, when your kitchen gets a redo, so does your dog. Miss Maggie's been bad...very bad! With the workmen in and out, she's pretty much been the free-range dog she's always felt she should be. I don't know where-in-the-world she got into whatever-in-the-world this blue and red stuff is (chalk?) But, she's multi-talented. And curious. And sneaky. I searched everywhere for the mystery substance but Maggie's sources remain a secret. My work crew was greatly entertained. The granite guys paid me a visit today. I had no idea things could get any dustier than they already were, but...hey, let the games begin! My exploration of the world of indoor dust is now complete. And, I have gorgeous, new granite countertops where there once were none. And a gorgeous fireclay farmhouse sink. Alleluia! Onward...to faucets, backsplash tile and paint! Winner, winner! Cathy, you are the randomly drawn winner of my minor ornamentation challenge. Please, email me with your address. You all submitted such beautifully creative and varied pieces of jewelry. With each one, I was amazed at your talent. It was such an honor to have you come to my little place, here on the web, and show me how you were inspired by the photo. I could see the rich colors and textures of our photo, translated from your fingers into your jewelry. This piece is so named because of the black beads I used near the clasp and the overall mood of the piece. The beads are old and awesomely timeworn and I believe they're mourning beads, made either of glass or jet. Back in the day, a widow was expected to remain in mourning for an extended period of over two years, and dress accordingly. The first stage was a period of a year and a day in which only dull black clothing was worn with no decoration or jewelry. The second stage of mourning lasted for about 9 months and "allowed for minor ornamentation by implementing fabric trim and mourning jewelry." This phrase "minor ornamentation" intrigues me and seemed to fit right in with the theme of my piece...a little bit dark and quite spiritual. The third phase of mourning was called "half mourning" and lasted about 3 to 6 months. During that time, more ornamentation was allowed and color was slowly re-introduced. It's all pretty fascinating to contemplate. ...and this vintage crucifix. Of course, the deep raspberry color faceted pearls and ruby fit perfectly with the inspiration photo. For the focal, I used this lovely old cut steel, mother of pearl brooch. This brooch is perfection. Look at the spikey, gothic-ish bezel. And the colors...yeah. My plan is to list this piece on Etsy, eventually. My shop desperately needs updating and attention but, with my house in such an uproar of remodeling, I've just put it off. So if, indeed, you're interested in this necklace, drop me an email. I challenged you all to join me in making a piece of jewelry inspired by the photo and you rose to the occasion in amazing ways. I've been so inspired by the jewelry you've created! And now, I'd like to present some of the lovely pieces my challenge participants have created. If you participated in the challenge and don't see your piece here, go to my original post, here, and leave the link to your piece. Or, leave your link on this post. I'll continue posting the finished pieces, here on my blog, as the links come in over the next couple of days (so make sure you check back!) and randomly draw a winner for the prize pot by Friday. Yes, indeed...progress is being made. My house is filled with dust and residue but, we have cabinets. And, they're fabulous! Of course, everything is still covered in plastic so you're just going to have to trust me...they're fabulous. I believe that, at this very moment, the granite is being cut for the countertops. As with all projects of this type, one thing leads to another. It's unavoidable. So now, the living room and entry will get a brand new coat of paint...a soft, dark-ish gray. What the heck...everything is in chaos anyway! Kitchen walls will be a warm, medium color of taupe to go with the glaze on the cabinets. I'm hoping this combo will give me a serene, calming effect when the whole thing is done. Until then, you can find me hiding in my room...the only untouched room in the house. Oh, did I not mention? We're in the process of painting the upstairs, ourselves. Brain, please begin to function properly again! Sanity, please return! It's Inspiration Monday over at the Ice Queen E-Zine (iceresin.com) where you'll find me guest blogging today. I hope you'll hop over and take a look. ...reveal my own inspiration piece and show you a brief peek at my design process. See ya then! ...and my life is a whirlwind fog of sheetrock dust and painter's plastic. It's finally a reality. Every room in my house is in utter disarray. I don't know what part of my beady little brain thought this wouldn't be that big a deal but that section of grey matter is clearly...clearly...defective. ...remember the hideous beast of a light box the original builders so generously installed in my kitchen? It's now gone! 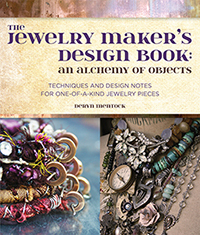 Erin is a super talented jewelry maker and longtime reader of my blog. She has an absolutely charming blog of her own...make sure you take a look at it, here. Erin, send me your address. I hope you enjoyed the blog hop and thank you all for playing! It's an old, mother of pearl brooch...pretty sizeable...with a brass, spiked bezel and cut steel trim. It's hard to tell from the photo but the mother of pearl is dark with swirling colors. Lately, I'm in a dark-ish mood. Not depressed or anything like that but more goth-ish. It's my favorite time of year. The weather has finally broken and I love the cool nights. The smell of wood smoke floats on the air. Camping, marshmallows, pumpkins and boots are in order. When I saw this brooch, that Interior Alchemy inspiration room popped into my brain. It's a perfect match and a perfect spark for a new piece of jewelry. Actually, I laid the piece out in about two shakes. It was formed in my head before I even knew it. And, here's my color palette. Take a stroll over to Brandi's blog if you'd like to learn how to make your own palette. She's got some awesome templates in her shop, as well. And she's got all kinds of great free stuff. You'll love it. If you like her blog, leave her a comment. She'll love it. So....here is my challenge to you: I'm dying to see what you do with this inspiration photo. Please, please, play along with me! This will be fun! Make a piece of jewelry, inspired by our inspiration room...necklace, bracelet, ring or earrings, whatever. Post it to your blog or website and link back here by leaving me a comment, on this post. I'll give you until Oct. 19th to finish. That's Wed. the 19th...that's a week and 1/2. If you play, I'll draw a random name from the players to win the goodies pictured above. You must comment, on this post...linking to your post with the photo of your finished work, in order to be eligible. But wait...I just realized, I MUST include some mother of pearl in my goodie bag prize so...there will be more than what's pictured. I have some pretty cool mother of pearl stuff so I'll have to dig around and see what I come up with. ...huge, chunky garnets...a vintage clasp...vintage glass mardi gras beads...great stuff! I realize you won't be able to use your prize winnings in your inspired piece but, that's ok. You can make a second piece and show us all your creative genius. Ok...don't forget...leave me a comment on this post, linking to your post with the photo of your finished jewelry piece. I'm SO thrilled that Rice included my class in the book. It was wonderful having her and Earl in class. The artist's projects are terrific but Rice has also included tons (and I mean tons!) of tips and mini interviews from lots of other artists and retreat attendees in this book. There's even a gorgeous guy in a kilt. If any of that piques your interest, leave me a comment on this post and I'll randomly draw a winner by the end of Tuesday!